← How Can Home Care Services Help Your Parent Cope with Low Vision? Did you know that elderly adults are more prone to falling than any other age group. They are also more likely to receive a serious injury because of the fall. From bumps and bruises to broken hips and head wounds, injuries from a slip and fall accident can threaten the independence and health of aging adults. Family caregivers should pay attention to the risk factors that lead to slip and fall accidents and do whatever they can to prevent such a traumatic event from happening to their loved one. * One out of every four elderly Americans suffer from a serious fall each year. 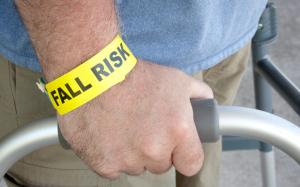 * Nearly 3 million seniors go to the emergency room annually for injuries related to falls. * More than 800,000 elderly adults are hospitalized each year due to slip and fall injuries. * 95 percent of broken hips are due to slip and fall accidents. * Medical costs for slip and fall injuries to seniors total more than 30 billion dollars annually. * Slip and fall accidents are the leading cause of fatal and non-fatal injuries in aging Americans. Family caregivers need to do what they can to reduce the risk of their elderly relative experiencing a fall. Some actions they can take include keeping the walkways clean and clutter-free, appropriate footwear, good lighting, sturdy hand rails in the bathrooms and regular medical visits. When an elderly person needs help staying healthy and safe, their family caregiver can step in and help. Why are Slip and Fall Accidents So Serious for Seniors? Slip and fall accidents can happen at any age, but they are the number one cause of fatal and non-fatal injuries for the country’s elderly adults. Falls can be triggered by an elderly person’s physical problems or from factors in their immediate environment. It doesn’t matter what the cause, an injury can be devastating. One bad fall also makes it more likely that an elderly person will experience another serious fall within the year. Seniors are faced with many health and aging challenges that makes falls particularly hard to recover from. One side effect of aging is that the bones become more brittle and are easier to break under impact. Seniors can suffer from a broken hip, arm or wrist and tear up the shoulders, knees and back. Head injuries are also common in seniors that have experienced a serious fall. There’s no doubt that slip and fall accidents have a significant impact on an elderly person’s life as well as for family caregivers. Often, a bad fall is the beginning of the end for seniors living independently. It’s not uncommon for them to need senior care assistance or long-term care after a serious slip and fall injury. That’s why it is so important for family caregivers to do their best in creating an environment that reduces the risk of slip and fall accidents. For Caregiver Services in Covington TN, please contact the caring staff at Personal Care Services MidSouth today! This entry was posted in Caregiver Covington TN, Safety at Home and tagged Caregiver Covington TN. Bookmark the permalink.